Achieve more cinematic results with your Mavic Air drone with this Polar Pro Standard Series 3-Filter Pack for DJI Mavic Air. 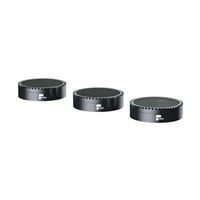 The pack includes three neutral density filters - ND4, ND8, and ND16 - that provide 2, 3, and 4 stops of light reduction, respectively, without changing your set color profile. They reduce shutter speed and enable capture of smoother motion rendering. These Standard Series filters feature HD glass and Polar Pro's signature lightweight AirFrame aluminum construction that doesn't affect the drone's gimbal operation. A protective carrying case is included to hold the three filters.